I'd say that they move closer to Theocracy or Communism. Anything else fits ill with the theme of the nation. Alright, cutting out the Populist stuff simplifies some coding stuff a bit, so that's a relief in some ways. Patagonia here has its basis in Argentina's Patagonia rebelde, which was a period in Argentine Patagonia's history when left-wing miners and right-wing government officials were fighting each other for years on end. 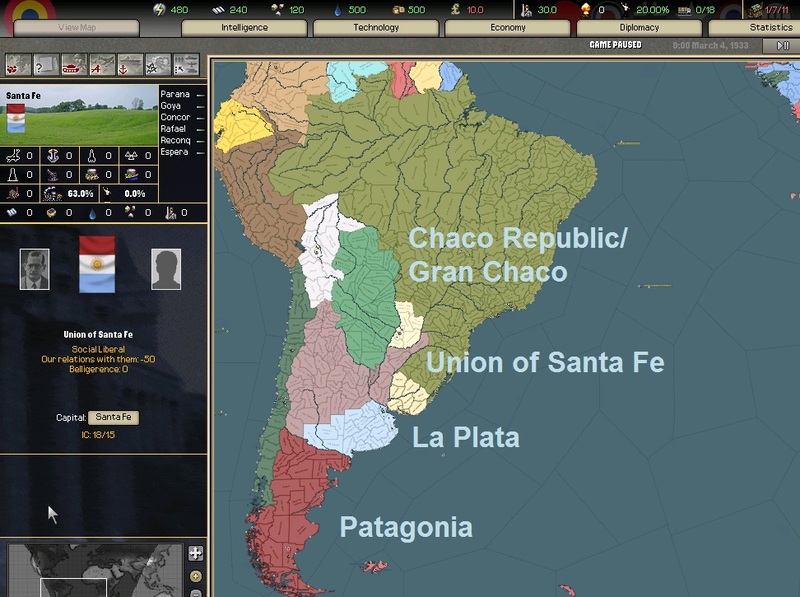 This Patagonia, then, is ruled by Communist miners, has a beef with La Plata to the north, and sits on a wealth of minerals and oil. La Plata is Argentina's equivalent to America's Columbia. It's the remnant of Argentina's government, still focused around Buenos Aires, stuck in Martial Law mode (historically Argentina was ruled by a series of president-generals during the '30s anywho) and upset at everyone who left glorious Argentina. The Union of Santa Fe is a marginally more-democratic state, created by a coalition of northern Argentine politicians. The provinces of Córdoba and Santa Fe seem like they were the focal point of opposition to the generals' rule in Buenos Aires, historically, so having them be idealistic chums-in-coalition makes some sense. The Chaco Republic/Gran Chaco is based in the Gran Chaco. There was a war here during this period, but having the region devolve into warlordism and cussed regionalism sounded like a Crimson Skies-y sort of thing to do when I tossed it in the game to see how it went. Canon CS material says practically nothing about South America aside from gold in Peru or Brazil or summat, right? Shouldn't conflict with anything there, hopefully. Fascinating links, great work too, this is fleshing out nicely! My take on WW2-ish events is that there could "possibly" be a three-way brawl, or a two-way brawl with a nation like France, or Britain and it's allies being "neutral" but taking pot-shots at whichever side irritates it the most. Britain and Germany have alot less tension than in reality. They are friends, however their allies might cause troubles which drive a wedge between them. Britain and France are not enemies either, but not "friendly". ANY WW2 type event will originate in North America, likely between Texas (Probably a lone-wolf type nation) and Louisiana (french), or Dixie or ISA VS the Empire State (Empire State doesn't say explicitly who is allies with). I am not familiar with the game or even gameplay style AT ALL, so I really cannot say more. I probably will pick up the game to get an idea (and to have as a base for any mods I need to install) though.